The following is a high-level overview of the e-file process within ACAManager. This overview is intended to provide an at-a-glance description of each step in the process. More detailed reference information is available elsewhere throughout this user guide section. 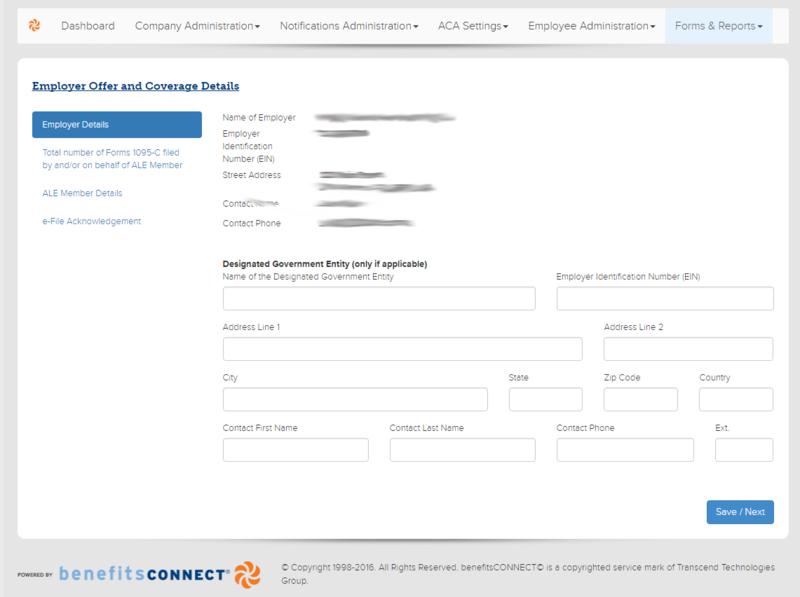 Once logged on to ACAManager, if you have access to multiple companies, you will need to select the company you want to e-file for and then click on Forms & Reports and select Employer Report & e-file. (Please note for those who only have one company to file for, you will just click the Forms & Reports and select Employer Report & e-file. To begin, you will select Edit, under the heading Employer Report. This will generate and take you through each step of the process. First, validate the Employer Details and review Employer Name, EIN, Address and Contact for accuracy. For those who have a Designated Government Entity, you would identify it on this page by filling out the available fields. Then click Save/Next. The next section of the process where you will identify the number of employees identified from the ACAManager system. If there are any you are transmitting that are not in our system, enter the count in the designated area. More details regarding this page will be available at a later date. Then click Save/Next. 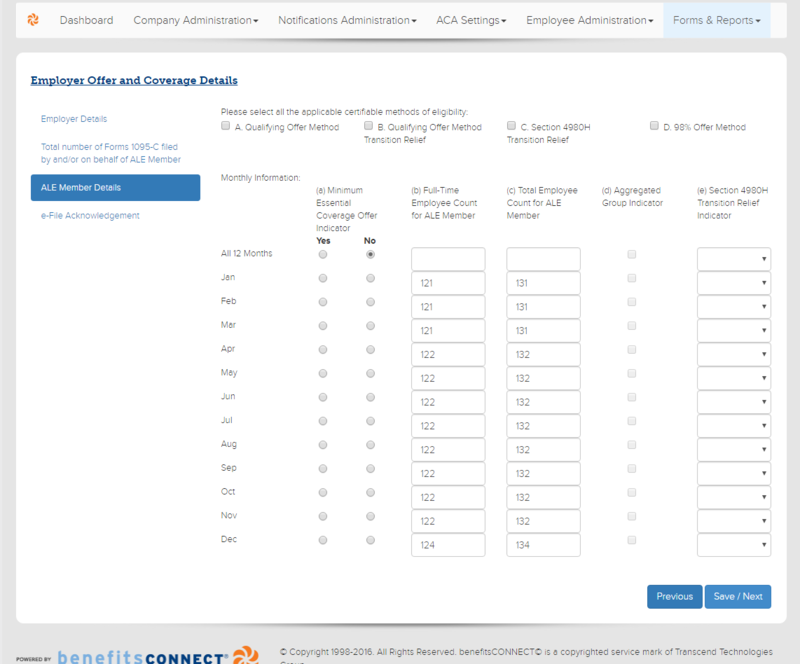 The next section is the Employer Offer and Coverage Details where you will identify which method(s) of eligibility you will be utilizing. Please be aware that you can select more than one if they apply. You will need to review and verify the information contained on this page. On the very right, there is a selection drop down for you to apply which transfer relief indicator is to be assigned to each month. Once complete, click Save/Next to continue to the final page of the process. The final section of the process is the e-file Acknowledgement where you will read and attest to the e-file Acknowledgement Terms. Once you click the check box, the e-file button will be available for you to submit. Please Note: Once you submit, there is no going back and making changes to your data to resubmit. If you did not submit your payment for e-filing processing, you will not be able to complete the e-file submission until your payment has been received. 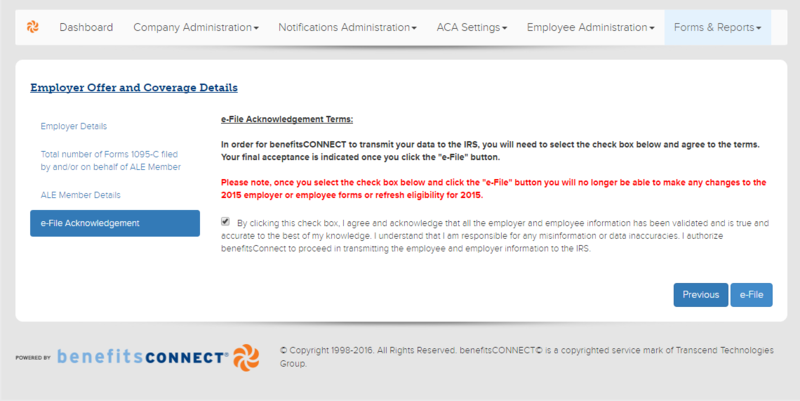 The e-file section of the ACAManager will than direct you to the Status page, where it will identify the Acknowledgement Date and your current status. Initially, you will be “In Process” until we get notification if your submission was approved or rejected. You may also download the report at your convenience.